Reincarnation is a philosophical concept, according to which a living being starts a new life in a different physical body or form after each biological death. It is also a part of the Saṃsāra doctrine. The urban fabric of Mumbai with its cultural background should experience a similar process of rebirth, withal preserving the spirit of the place. 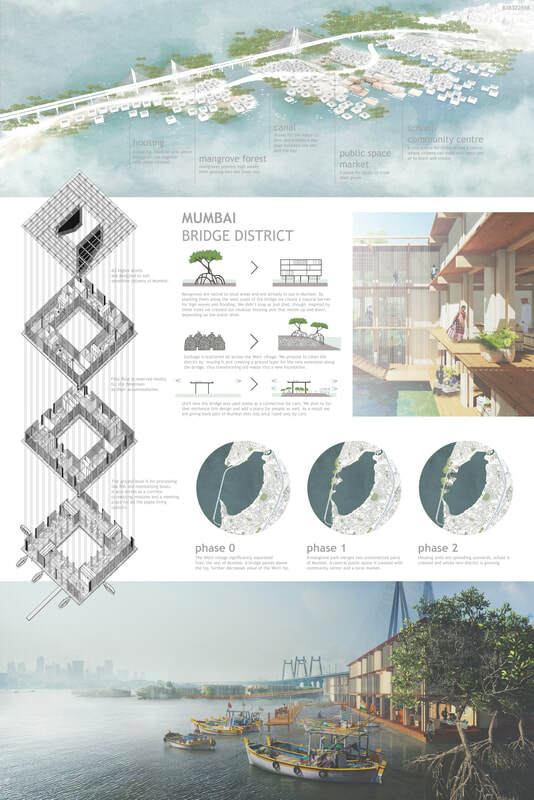 The newly invented typologies borrow forms from traditional Indian dwellings and take into consideration modern rapid urbanization, being installed into a flexible structural network, which provides Koli and Worli with all the possible scenarios that the inhabitants would ever desire to create. Drawing of the income concentration and construction on the struggle for living. Two worlds, two realities given by differences of opportunity and space. Between them, an emptiness as a call for a just world for all. Realizing the value of its existence as a sociability condition, revealing, in a paradigm shift, 'the under the bridge's use for life programs, transforming the city’s infrastructure-line into an an expandable place of citizenship experience, What is done as urgency through the appropriation of residual spaces is part of a search of the city’s vocation to exist in a plentiful and plural way. 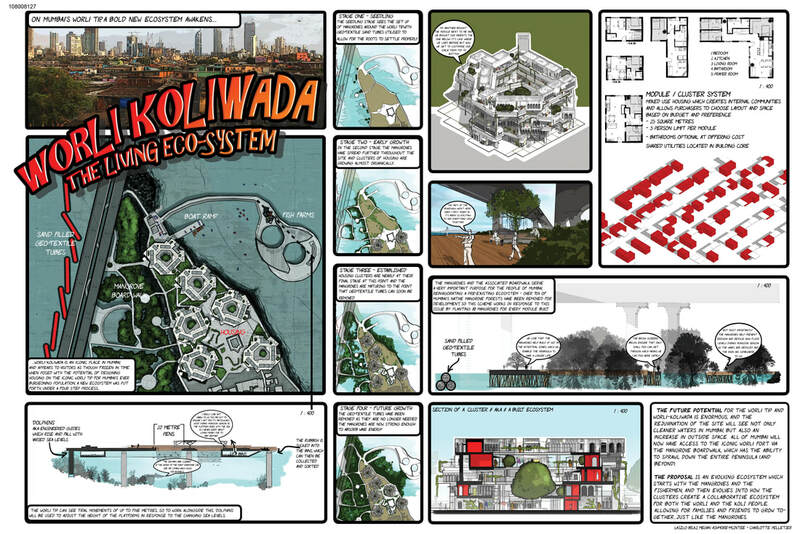 Worli Koliwada is currently threatened to disappear under water due to climate change. This project aims to document the situation and the letting the imagination draw the new story. In order to keep the story going, a system that supports the ongoing integration of land and water is proposed. 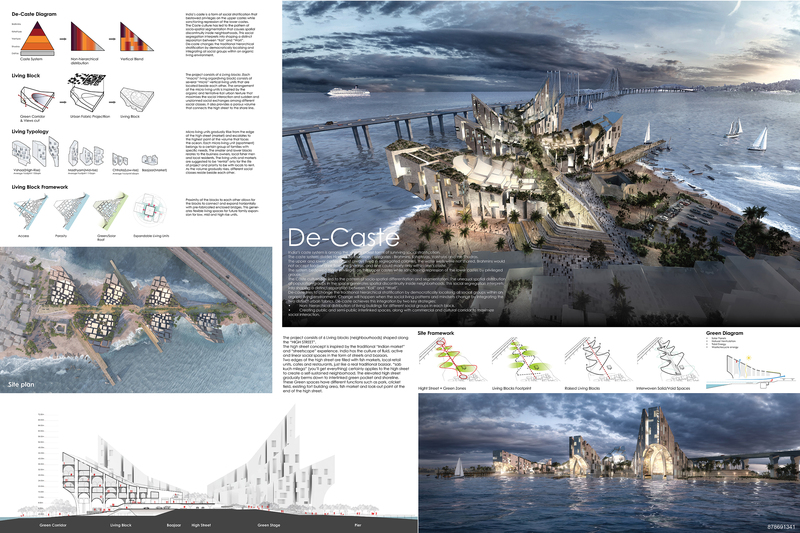 It is made of typology raise over the base of the existing situation aiming to reflect all what is below the surface of the water. When boats become the only way to move, the drowned are lost in sight below their evolving houses all oriented around the core which starts from the villages base where it all began. Though the city and history will be lost in sight they will still kept in memory through the vertical growth of their heritage. Koliwada's Koliving is about sustainable design creating places that work for people, which are socially inclusive, as well as environmentally resilient. 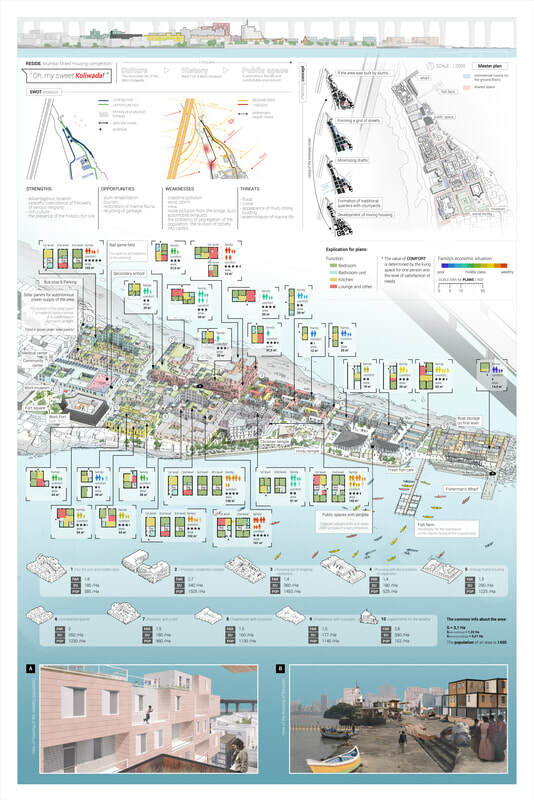 Responding to the unique qualities, traditions and needs of the Worli Koliwada Peninsula, we propose a sustainable community plan, which aims to promote a sense of equality, belonging and pride among existing and new residents. This is achieved, in part, through ‘common ground’, on land and on water: attractive new public spaces, streets that encourage life and activity, new infrastructure and highly adaptable mixed residential units – an exciting model to inspire communities addressing issues of resilience, growth and integration around the world. Old cities are disappearing. It can be easily recognized that cities around the world have become similar. Including Mumbai. Our design begins with a question: how to preserve local life and city fabric and make it continue. We combine houses of different sizes that are derived from local housing units, trying to make a compact, intimate and memorable neighborhood. We create a shared platform that grows from the ground so that everyone can pass through, communicate and move forward. Down the platform and close to the water are different sizes of sunken gardens and along with the Worli fort, open to anyone in the city. Our proposal is based on creating a long-term solution to issues associated with living so close to the ocean. We start with expanding outside useable space by bringing it offshore. To ensure a future proofed site, the bulk of our scheme references mangroves and the way in which they create safe new ecosystems. 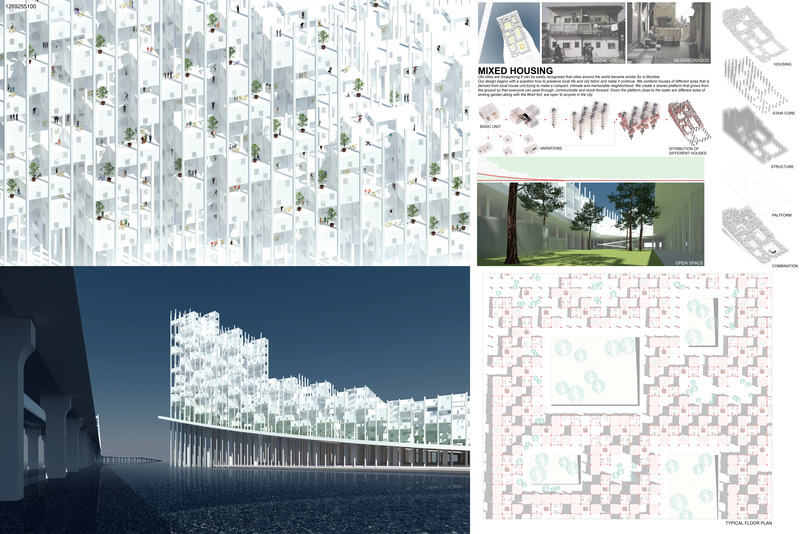 The housing is a series of modules which form social clusters where the inhabitants can have say in the way they live. Finally, we try to follow traditional vernacular as closely as possible, and have designed what we believe would be an amazing community to grow in. 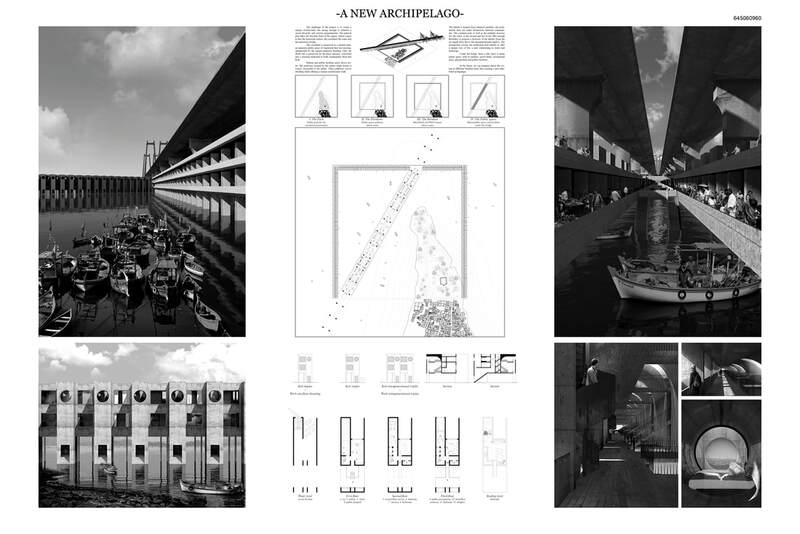 The absolute square plan challenges the territorial context, coastland, water and motorway bridge, to create a unique architectural site strong enough to federate a social diversity. The coastland is preserved as a natural park while habitat and public facilities grow above water. The habitat takes place on the square perimeter and offers a unique way of life, a new relationship to water and landscape. 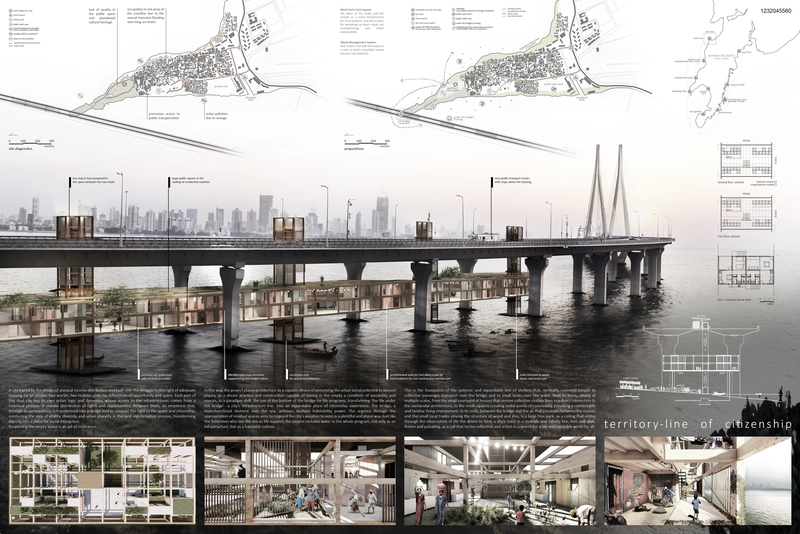 Under the bridge, there is urban public space, with markets, sports fields, playgrounds and public facilities...In the future, we can imagine repeat the system in different Mumbai areas thus creating a new inhabited archipelago.
" OH, MY SWEET KOLIWADA! " We took into account the context of the place, its cultural and historical significance, when designing the territory. 8 types of housing for different segments of the population were developed. The planning solution is the introduction of slums scale in the new development. It is This creates integrity of the Worli Koliwada. The plans are designed taking into account ergonomics and human needs. There was also an emphasis on ecology. We propose to use local materials and recycled waste in construction. The settlement is completely autonomous. There are solar panels on the roofs to generate electricity​. This team designed an open platform where the Koli are provided a chosen portion of space to economically benefit through farming, residing and selling their products. They can reside closely from their workplaces and are provided both the ways to commerce and live. Most of all, the platform will serve as an attraction. It will attract people across not only India but also visitors from other countries. As a multi-functional and experiential space, this platform will serve as an open-rental space for visitors. The platform thus, erases the distinction between classes and offers a mixed experience to all the users. 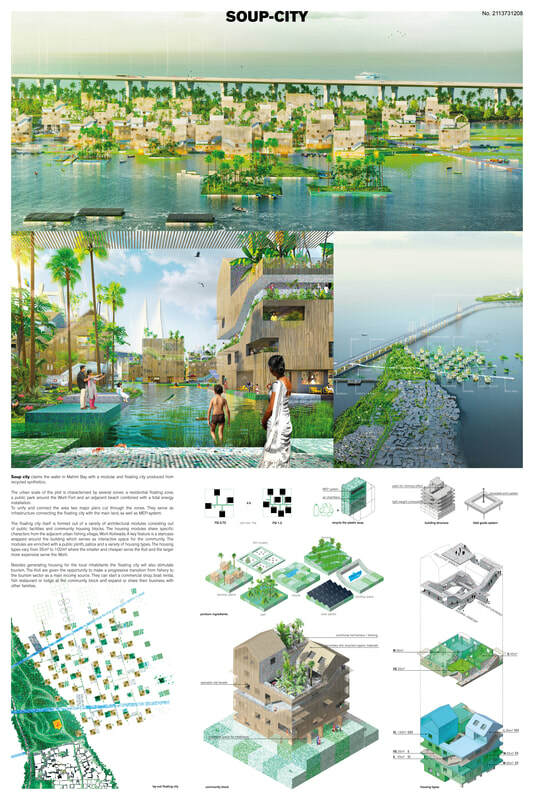 Hyporocity is a hybrid system of infrastructure, co-habitation (living and working), and civic space on bridges to be built on the city periphery. Historically, Mumbai expanded through newly reclaimed land and along the railway. 40% of the city is expected to be underwater by 2050. 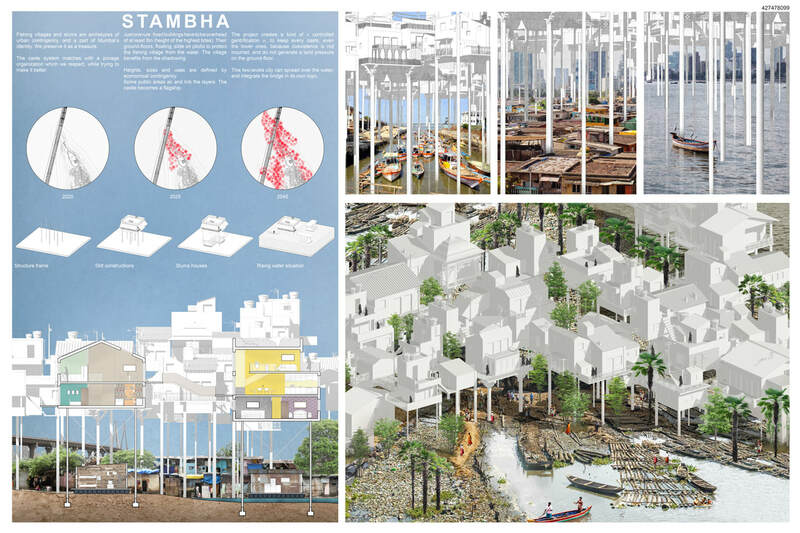 Through the hybridized system, Mumbai can re-engage with land that is constantly under threat of flooding and provide much needed infrastructure to sustain the city. 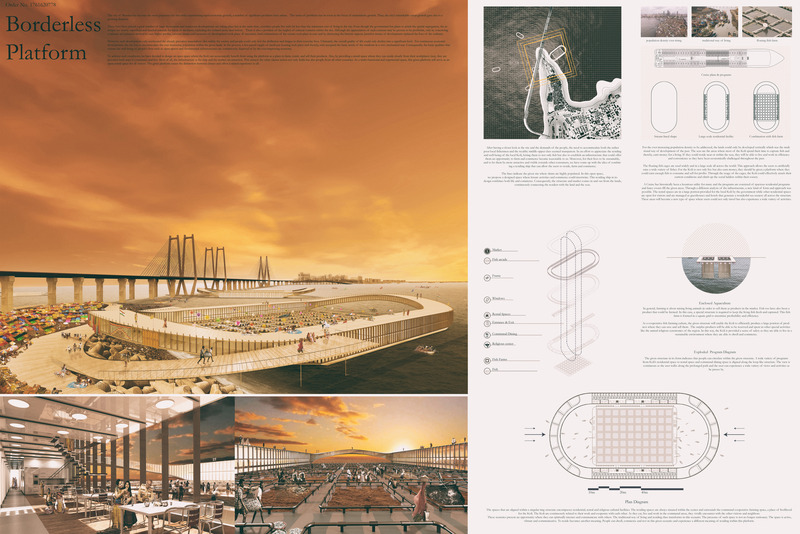 Using the Worli-Sea Link as a prototype, Hyporocity uses the planned development as an opportunity to morph the city inflicted by natural forces and infrastructural failure along the new periphery. India's caste is a form of social stratification that bestowed privileges on the upper castes while sanctioning repression of the lower castes. The Caste culture has led to the pattern of socio-spatial segmentation that causes spatial discontinuity inside neighborhoods. This social segregation interprets into shaping a distinct separation between “Koli” and “Worli”. De-caste changes the traditional hierarchical stratification by democratically localising and integrating all social groups within an organic living environment by: Non- hierarchical distribution of living buildings for different social groups in each block. Creating interlinked public spaces, along with commercial and cultural corridor to maximize social interaction. 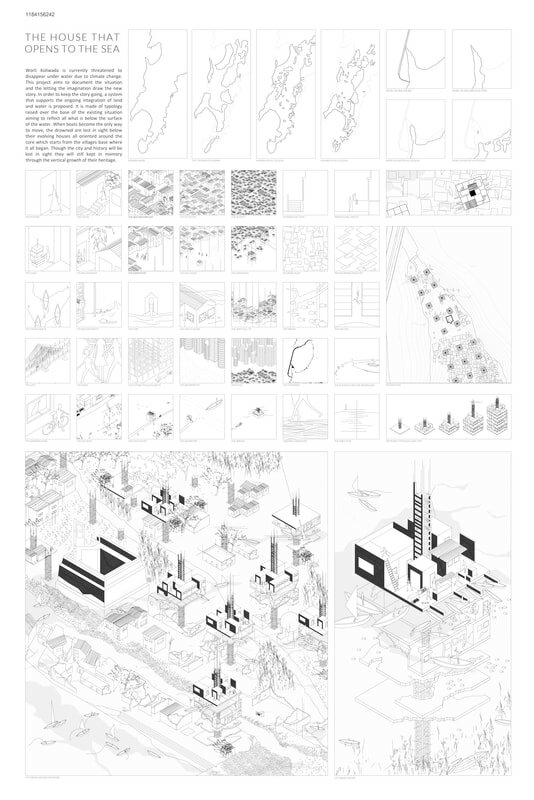 The project proposes a new manifesto for housing in the city, by rejecting commodified housing types and creating a new system for the organization and delivery of housing based on type of user and designing with the primary goal as rental use. 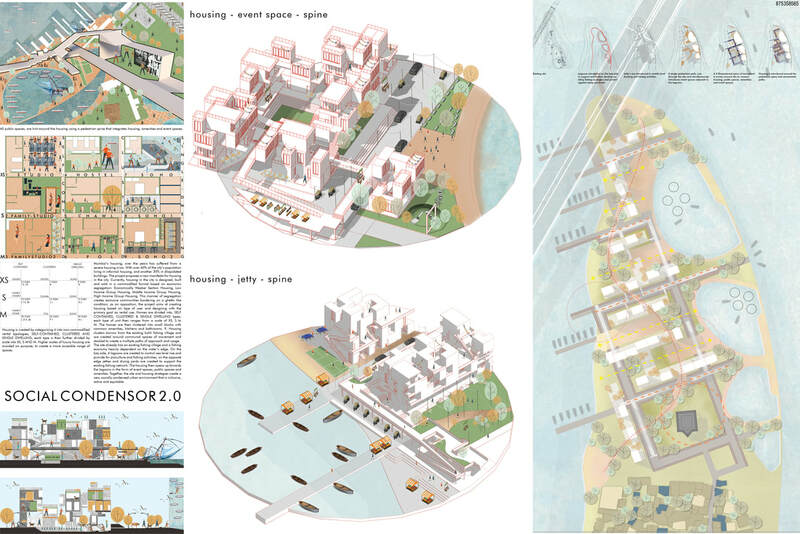 Homes are divided into, SELF CONTAINED, CLUSTERED & SINGLE DWELLING types, each type of unit then ranges from a scale of XS, S to M. Borrowing from the existing fishing village, Homes are created around a public spine, communal spaces and stacked to create a multiple paths of approach and usage. The tip of the Worli island is one of the last undevelopped open space in Mumbai. We propose to preserve this land and create a generous public space composed of a myriad of gardens. 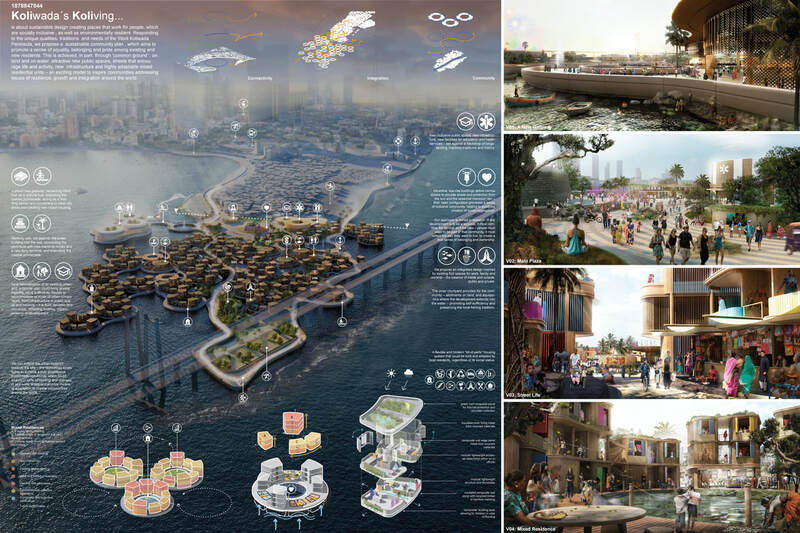 This park would connect the village of Worli Koliwada, the fishing harbour and new housing projects developed on the water : in the bay, a village of modular houses on stilts and floating houses, on the west side, a cluster of towers rising from the sea. A dike would protect the land from the sea and create a promenade ending with an open water bath. 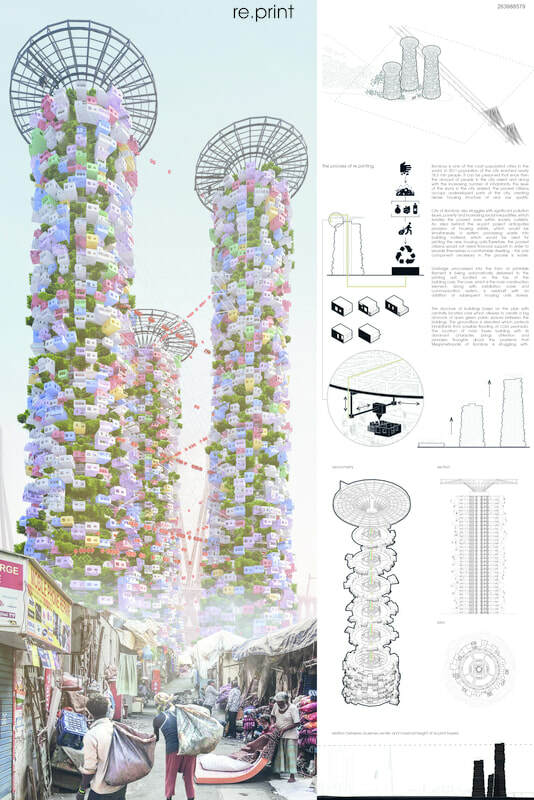 An idea behind the project anticipates provision of housing estate, which would be simultaneusly a system processing waste into building material, which would be used for printing the new housing units. Garbage proccessed into the form of printable filament is being automatically delivered to the printing unit, located on the top of the building core. The core, which is the main construction element, along with communication system, is overbuilt with an addition of subsequent housing units storeys.The location of main tower building with its dominant character, brings attention and provokes thoughts about the problems that Bombay is struggling with. Plaastikolis generates energy from wastewater through anaerobic digester that is decentralized around the project, forming a localized grid. This creates a self-reliant and robust system for the people of Worli Koliwada. 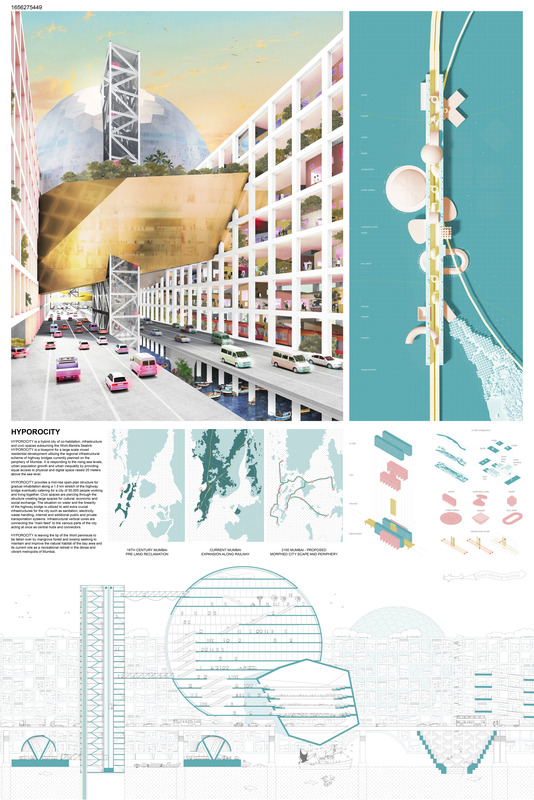 The new megacity is a alternative response to elevate tradition by facilitating a new economic threshold - where it performs as a urban waste mining, with closed loop economy system. The fisherman of Koliwada will fish for a new resource - (plastic) for it to be recycled and manufactured in the factories around the mixed development to become new products, particularly plastic fabric (or polyester). 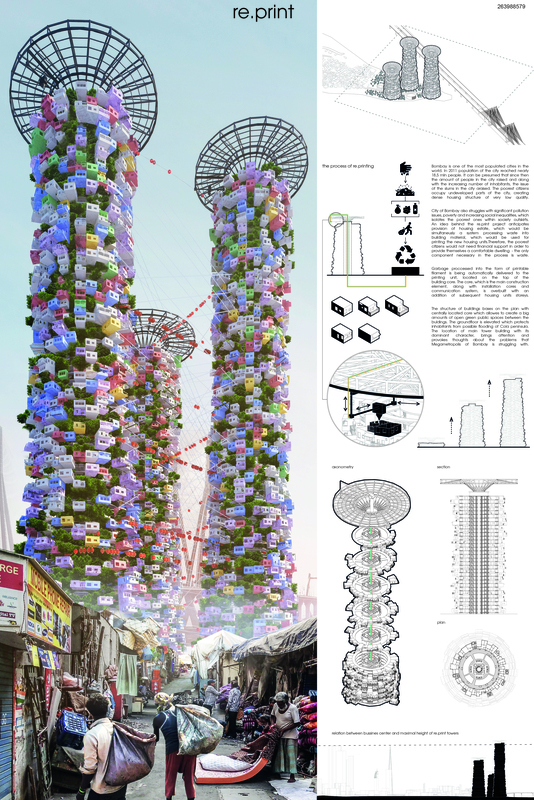 This in turns manifest a new economic and cultural point in the city of Mumbai. 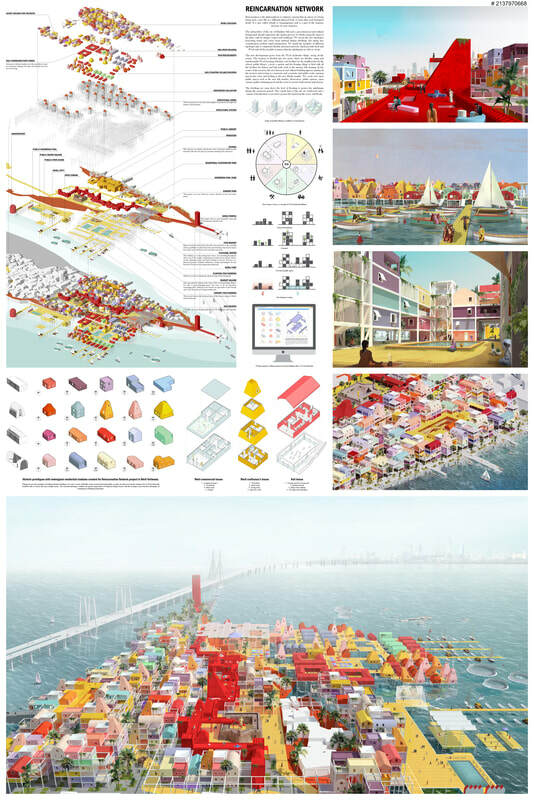 Soup city: Claiming the water in Mahim Bay with a modular and floating city produced from recycled synthetics. The urban scale of the plot is divided in several characteristic zones. 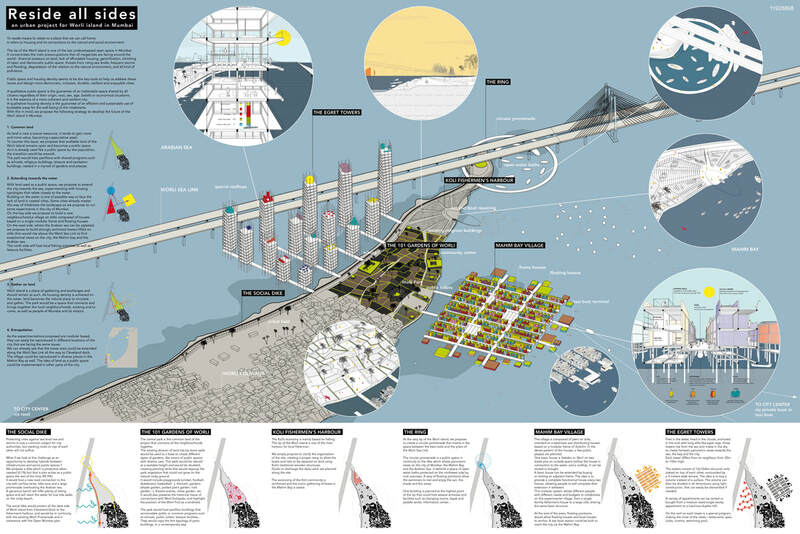 A residential floating zone, a public park around the Worli Fort and an adjacent beach combined with a tidal energy installation. 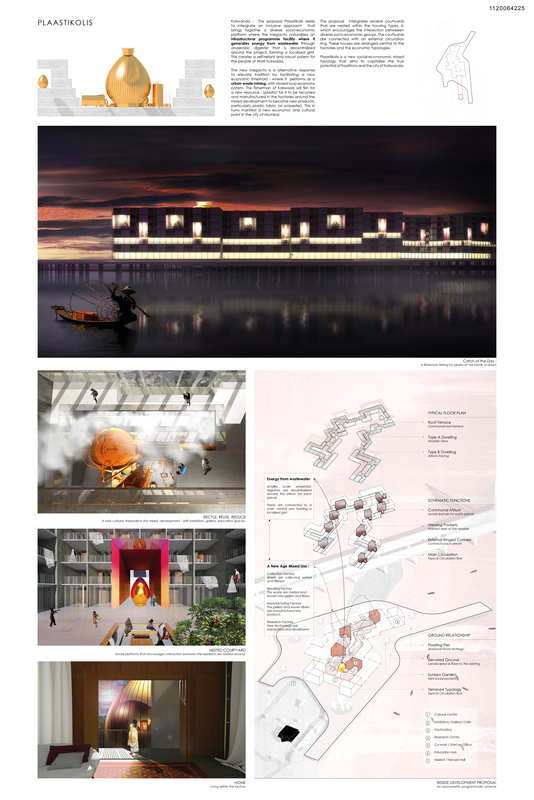 The floating city itself is formed out of a variety of architectural modules consisting of public facilities and community housing blocks. Soup city: The safe haven for future traditions of the Worli and the Koli.